"An attractive Worcester press-moulded plate with scallop-edge and additional border transfer printed flower groups in underglaze blue. The main Pine Cone Group pattern is understandably one of the most popular blue and white floral designs produced by the eighteenth century Worcester porcelain works. This piece is a particularly good representative example as the pattern works and displays best on larger flatware." Antiques Expert Hamilton Bear. 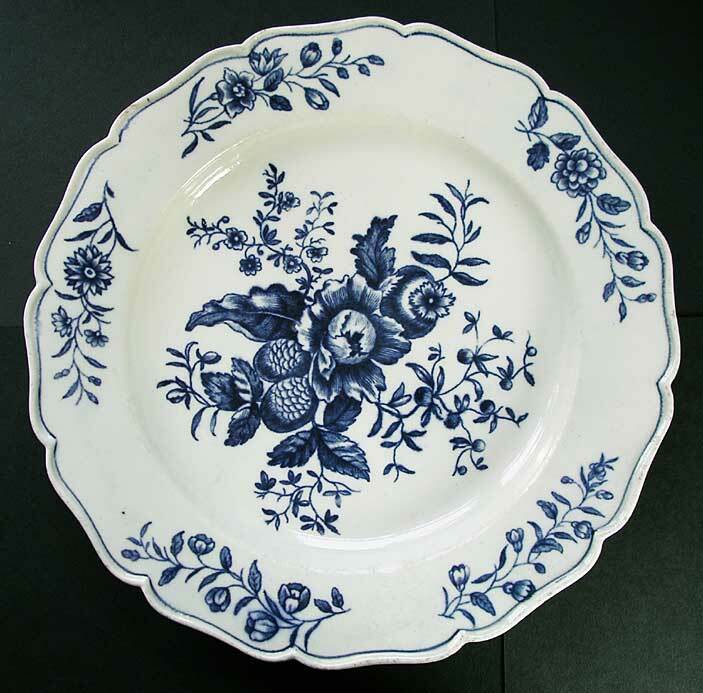 References: See, Branyan, French and Sanden, Worcester Blue and White Porcelain 1751-1790, page 382 The Pine Cone Group II.C.11 for an identical scallop-edged plate illustrated. Dimensions: width 240 mm max. approximately 9 1/2 inches. Marks: hatched crescent mark as illustrated. Condition: Excellent display condition. Condition report: There is one small flat rim chip to edge (illustrated enlarged) which is easily missed in generally viewing. Print is a particularly fine and crisp example with no blurring. 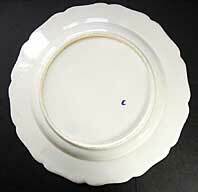 Plate is free from staining or discolouration and there is no restoration. A good example.